"Skarn is an indomitable force of zealous power; it's best to stay out of his way." Bring immortal brawn to your Descent: Journeys in the Dark game with the Skarn lieutenant figure. 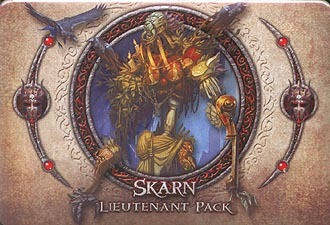 This pack also includes the "Twisted Soul" plot deck and threat tokens, giving the overlord additional game options and the ability to recruit the unstoppable Skarn into any Descent: Journeys in the Dark campaign.